Six kilometres below, Rambara village is a resting point for devotees going to Kedarnath Temple. Its 43-year-old resident Sankar Gosai shudders to recount the sight of the enormous amount of water gushing down the mountain. In no time, long stretches of a road and houses were swept away. “It had been raining nonstop since June 14. Fearing flood, we had climbed up the hill. But we never imagined that such a huge amount of water could swoop down all so suddenly,” he says. Gosai walked down the precarious mountain for two full days till he reached Rudraprayag town. Rakesh Singh, 36, had a miraculous escape because he clim bed the temple roof. He came to Kedarnath with 12 family members. He does not know where the others are. It all started at Chorabari glacier, say people who have managed to return. The glacier lies on the slope of the 6,940- metre Kedarnath peak of the Himalaya. The glacier is 7 km in length, its basin area is 38 sq km and the ice cover is 5.9 sq km. It has two snouts—one is the source of the Mandakini (at 3,865 metres) and the other becomes the Chorabari Lake (at 3,835 metres). People recall that on June 16 the lake exploded when clouds burst over it. The lake is 6 km from the temple upstream the Alaknanda. Ensuing rains cut off the hilly districts of Uttar kashi, Rudraprayag, Chamoli and Pith oragarh from the mainland and battered the land till it crumbled. Pithoragarh faced the disaster twice—on June 16 and on June 22, says Naresh Ram, resident of Kholi village. There, the lake of Milam glacier burst when clouds burst over it leading to overflow of two rivers which emerge from the glacier—the Goriganga and the Kaliganga. The lake still holds a lot of water, so the district may witness a similar disaster soon, he warns. “I have never seen anything like this. It was as if someone was throwing water from under the ground,” says Vivek Rawat, 27, who worked at a hotel in Gaurikund, about 15 km from Kedarnath. Almost everything in Gaurikund is demolished, he says. Eyewitnesses have similar stories from Kedarnath Temple and Hemkunt Sahib. Nobody is yet sure of the reason. On June 18, Sushil Singh, resident of Mirzapur, Uttar Pradesh, ran down from Gaurikund to Gaurigaon to save his life. There is no trace of the 14 people he came with, he says. Around 5,000 people like him reached the village. But most were ill. They had swallowed mud that had flowed with the water. Many died of it at Gaurigaon. The rest waited beside the bodies, to be rescued. Akhilesh Srivastava of Jhansi wept on seeing food. His family was stranded at Hemkunt Sahib near the Valley of Flowers. Army personnel helped them walk down to Govindghat in Chamoli district, from where they were taken to Joshimath. They trekked till Rudraprayag because they had run out of money. “Private taxis were charging double the fare and the private helicopters were demanding Rs50,000 per person to reach us to safety,” he says. During the trek, they sucked their wet clothes when thirsty. His six-year-old son chewed grass in the night when he could not withstand hunger pangs. Every year, Uttarakhand’s Garhwal region receives pilgrims in thousands for Chhota Char Dham yatra—Gangotri, Yamunotri, Kedarnath and Badrinath. It also receives heavy rains and suffers floods. But the loss the region has suffered this time is horrifying. According to the Char Dham control room records, there were 26,000 people in Kedar Valley on June 16. This is where the temple is located. Records also show that 39,000 people had left the valley that day for Badrinath, Gangotri, Yamunotri and Hemkunt Sahib. The government’s figure of about 800 total deaths is too conservative. The number, clearly, is in many thousands. 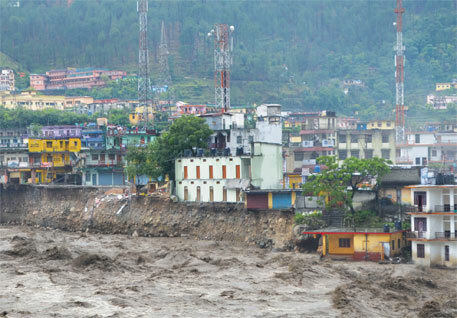 The raging Bhagirathi, Alaknanda and Mandakini have swollen like never before and swept away whatever came in their way. As many as 2,052 houses have been wiped out, 147 bridges have collapsed and 1,307 roads destroyed, says Rakesh Sharma, state infrastructure development commissioner. The upper reaches of Uttarakhand look as if the region has travelled a hundred years back in time. The Gangotri and Yamunotri highways are damaged at several places. 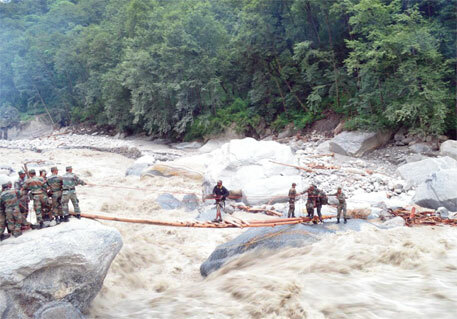 The rivers have damaged the 36-km stretch from Uttarkashi to Bhatwari at six places. Higher up, roads are damaged due to landslides. “The stretch of road between Matli to Maneri in Uttarkashi is so badly damaged that one cannot tell when it can be repaired,” says Sharma. Three drinking water projects have got washed away in Garur block, while 71 streams and 40 canals have been damaged. As per preliminary estimates, says Sharma, the disaster has cost Uttarakhand Rs 50,000 crore in infrastructural loss. Uttarakhand Jal Vidyut Nigam Limited has suffered loss of Rs 77 crore apart from the Rs 50 crore lost in power generation. The mountain was never so fragile, says Harish Rawat, a BSc student in Bhatwari region. Heavy machines plying every day on kuchcha roads have weakened it, he says. “Now we suffer landslides more often.” Rawat lost his home to a landslide in 2010, which wiped out 25 houses and 28 shops. Near Silli village, 17 km from Rudraprayag, the Mandakini has shifted course and washed away all the structures along its banks, says Prakash Thapliyal, who lost his house. “The river shifted course because of Larsen and Toubro’s Singholi-Bhatwari hydropower project. All the debris was dumped on the riverbed,” he says. In Srinagar, the training centre of Sashastra Seema Bal was damaged apart from several houses in low-lying areas. “The deluge was the result of the dam at Srinagar. Its floodgates were opened without warning. The water carried all the debris at the dam site and brought it here,” says resident Arun Negi. In August 2012, when flash floods occurred in Uttarkashi, the Uttarakhand Disaster Mitigation and Management Centre had recommended strict regulation of developmental initiatives near streams and rivers. No heed was paid to it. In Rudraprayag, no structure is allowed within 100 metres from the river’s banks. 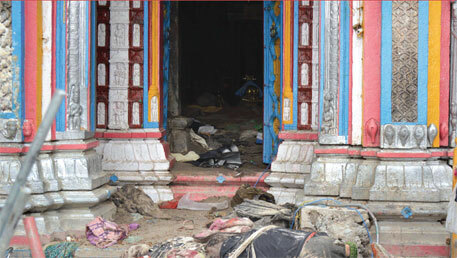 The flood widened the river’s course by 15 metres and caused damage worth crores of rupees. “What else does one expect from the mountain if there is heavy tourist rush at vulnerable areas. The Himalaya is a young mountain and you dynamite it to build roads. Landslides are bound to happen,” says Anand Sharma, executive director of Dehradun Meteorological Centre. In the wake of the disaster, Jayanthi Natarajan, minister of environment and forests, issued a statement that the National Ganga River Basin Authority had notified 130 km stretch from Gaumukh to Uttarkashi as an ecosensitive zone on December 18, 2012. The notification, thus, prohibits activities such as setting up of hydroelectric power plants of more than 25 MW, extraction of river water for new industrial purposes, mining except for domestic needs, stone quarrying, deforestation, burning of solid waste. Natarajan, however, did not mention that the area near the Alaknanda and the Mandakini has not been notified. This is where stone quarrying is done most. Who is to be blamed for the burgeoning number of deaths in Uttarakhand? Ten days after gargantuan amount of water rolled down the Himalayas, weather scientists are still trying to understand what went wrong. The prognosis may still take some time, but as the tragedy unfolded, it was clear that different state government agencies have a lot of blood on their cuffs. Despite warnings from the India Meteorological Department (IMD), the state machinery could not crank itself up to meet the challenge. On June 13, IMD’s Delhi centre, which serves weather-related needs of seven north Indian states, issued a warning that the state would receive “rather heavy rainfall”. The term denotes precipitation between 35.6 millimetres (mm) and 65.4 mm within 24 hours. The forecast was elevated to “heavy rainfall” (64.5 mm to 124.4 mm) on June 15. On June 16 and 17, IMD warned of “extremely heavy rainfall” (244.5 mm and above). But the state government found its feet stuck in the mud even before the rains had arrived. At 9 a.m. on June 15, IMD’s Dehradun centre issued a bulletin to the state government that five places in the state—Joshimath, Badrinath, Kedarnath, Yamunotri and Gangotri— would receive “rather heavy” to “extremely heavy rainfall” in the next 72 hours. The forecast was sent to executive director of the state management and mitigation centre, inspector general of police (intelligence), inspector general of Indo-Tibetan Border Police, Doordarshan and local media. IMD advised pilgrims to cancel their travel up the hills. The State Disaster Management Authority (SDMA) was also intimated but did not know what to do. Many reasons for one calamity Cloudburst in Uttarakhand is nothing unusual for weathermen. Moisture-laden clouds imploding and dropping large volumes of water over a few villages is a common peril in the hill state. But the events of June 16 were unprecedented; it was not a cloudburst but a vicious natural event akin to a gigantic watery bulldozer rumbling down and flattening everything. The cause of the calamity is still not clear. Cloudburst was ruled out within the first few days of the disaster. The few Kedarnath pilgrims who survived called the onslaught Himalayan tsunami. The rocks and boulders that came down made geologists and glaciologist wonder whether it was Glacial Lake Outburst Flood (GLOF), a phenomenon the Himalayas are becoming prone to because of global warming. But the theory is slowly losing steam. What has puzzled scientists is that the region did not receive an extraordinary amount of rainfall to have caused such a huge flood. India Meteorological Department (IMD) does not have a rain gauge near Kedarnath Temple, so it cannot say how much rain fell there. But it does know that heavy rains are not unexpected there. Between June 14 and 18 most places, including the ones that witnessed maximum damage, received what IMD calls “heavy rainfall”— 64.5 millimetre (mm) to 124.4 mm in 24 hours, a category below “extremely heavy rainfall” (124.5 mm to 244.4 mm). Tharali in Chamoli district received 173 mm rainfall on June 17. That day, in Uttarkashi, Dunda received 185 mm rainfall and Purola 165 mm. Only Dehradun received “extremely heavy rainfall” on June 17 with 370.2 mm. Meteorologists are considering whether the timing of the rainfall could have created the problem. Monsoon hits the Himalayan state in July. Satellite images of National Remote Sensing Agency show substantial increase in the amount of snow in the area above Kedarnath Temple on June 21, an indication that the area around Chorabari Lake, the snout of the Mandakini received heavy rainfall. Heavy precipitation, both in the form of snow and rain led to large amount of water flowing down the slope. This brought down debris lying on the path to the Kedarnath settlement. The satellite images also show that this precipitation led to release of a lot of water, so much so that a new stream was formed in the area. It is uncertain whether the Chorabari Lake also breached leading to huge gushes, although many survivors on pilgrimage to Kedarnath say it did. Nevertheless, the quantum and force of water was enough to wreak havoc. Glaciologist Anil Kulkarni, who is a visiting scientist at the Indian Institute of Science, Bengaluru, adds a bit more. 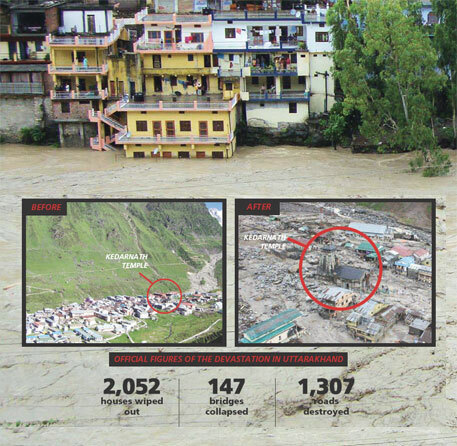 Kedarnath received 120 mm rainfall in 24 hours before the flash flood on June 16. 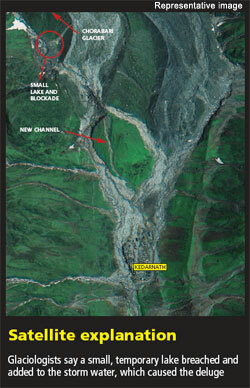 There is evidence that a small lake was formed during these rains above the Kedarnath town (see satellite image). The 1-hectare lake contained 10 million litre water. The lake must have lasted a small duration and its water must have come down along with the water from the glacier. The lake burst due to a breach in the blockade. Coupled with heavy rains in the area, this caused flash floods. Because of the lake there was excessive stream run-off and a third channel emerged. The state is among five in the country to have Disaster Mitigation and Management Centre (DMMC), an autonomous body for disaster management. Once SDMA and DMMC receive the warning, they should relay it to district magistrates. Every district should have a district disaster management authority (DDMA), which should comprise people who can interpret IMD data. On June 16, state government officials did nothing more than issue an advisory about open and blocked roads. Soon, heavy downpour caused floods and landslides. 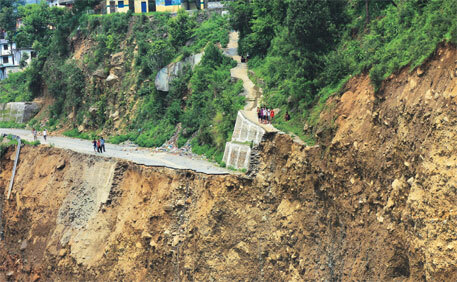 Mud and debris from hill slopes cut off vital road linkages within the state. Twelve bridges crumbled. On June 17, the state government finally shook off its inertia. The chief secretary held a meeting with the state disaster management team and issued an alert that rescue operations should begin on June 18. But by this time most of the damage had been done. The shoddy relief and rescue work was because the authorities have nothing to guide them. The Disaster Management Act of 2005, under which the National Disaster Management Authority (NDMA) and the SDMAs were set up, gives broad guidelines for disaster management. Every state has to frame its own disaster management Act keeping local conditions and dangers in mind. The Uttarakhand government failed to do so. Since there is no such Act, district magistrates do not know the standard operating procedure, say senior SDMA officials. “There are limited number of roads that connect villages in Uttarkashi and Chamoli,” says NDMA member Jyoti Kumar Sinha. “We had suggested to the state authorities that they identify locations on roads where food stock and supplies could be stored for trekkers. At least the food shortage that many pilgrims faced in disconnected areas could have been averted to an extent,” he says. SDMA was formed in 2007. But five years later, it is yet to frame a disaster management plan, the Comptroller and Auditor General (CAG) of India, which audited SDMA, stated in its report. CAG also pointed out that only 66 of the 117 sanctioned posts in the state authority have been filled up. 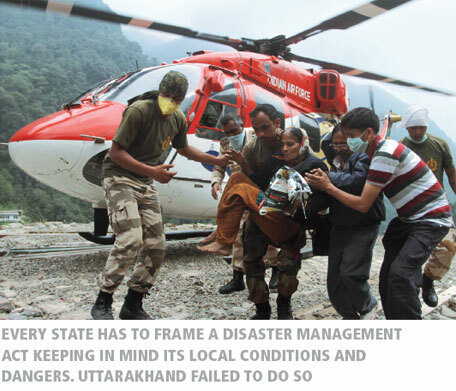 In May and June 2011, NDMA had conducted mock drills in Dehradun, Haridwar and Tehri Garhwal to test disaster preparedness in Uttarakhand. The result of the drill was not made public, but it was clear that there were communication gaps between government agencies. It also noted that coordination between agencies at state and district levels was better than at the local level. This, in effect, meant that practical implementation of disaster management would have gaping holes. NDMA was constituted in 2006 to lay down policies and guidelines for effective management, risk mitigation and prevention of disasters in the country. It is headed by the prime minister. Its performance in the last seven years has been anything but sterling. The authority is accused of taking up projects and leaving them incomplete. In 2008, NDMA initiated a nationwide project on floods and landslide mitigation. These projects have either been junked or have gone back to the drawing board midway. Similarly, a project to prepare a vulnerability atlas of landslides, floods and earthquakes started five years ago. It is still incomplete. In April 2013, CAG placed a report in Parliament pointing out that NDMA is not properly informed about the disaster management work in states. Projects that were initiated for disaster preparedness and mitigation have not been properly implemented, it states. Worse, since 2010 the authority has been functioning without a core advisory committee of experts that advises it on different aspects of disaster management. According to the Disaster Management Act of 2004, NDMA should have an advisory committee of experts for disaster management at the national, state and district levels. In 2007, it constituted its first advisory committee for two years. The committee’s term was extended for a year. After its end, setting up of a new committee was delayed because many ministries failed to nominate experts, say NDMA officials. At present, the names are being reviewed by the Prime Minister’s Office, they say. The CAG report states that NDMA has not performed the functions as prescribed in the Disaster Management Act. These include recommending provision of funds for the purpose of mitigation and recommending relief in repayment of loans or for grant of fresh loans. Besides, several critical posts in NDMA are vacant and consultants were used for day-to-day working. Ever since Uttarakhand was created in 2000, the state government, be it of the Congress or the BJP, has been working with one agenda-exploit natural resources of water, forests and minerals to develop infrastructure, without caring for its consequences on nature. The development is triggered mostly by the deluge of pilgrims who visit the holy places in the state annually. In the past decade, the number of tourists has risen by 155 per cent, the state’s tourism department data shows. Last year, 28.4 million tourists visited the state between May and November. The state’s population is 14 million. There is hardly any place to accommodate the visitors. A survey done by the Indian Council for Research on Inter national Economic Relations in 2006 states that there are an average of 102.5 hotels per million tourists in the state. Shortage of dwelling units has led to mushrooming of illegal structures, some right on the riverbanks. The state government’s 2000 notification to prohibit construction within 200 metres from the riverbanks was not adhered to. In 2011, Dinesh Bhardwaj, a resident of Roorkee, filed a public interest petition in the Uttarakhand High Court and identified several illegal structures along the banks of the Ganga, Song, Bhagirathi, Alaknanda and the Mandakini. The Bench comprising Chief Justice Barin Ghose and Justice Alok Singh ordered the state government to demolish all structures along the banks. But the state government did not act, says Bhardwaj. Floods have brought down hundreds of small hotels on the riverbanks. The main indicator of a thriving real estate business are the Himalaya itself, hollowed down for boulders, pebbles, sand and gravel. 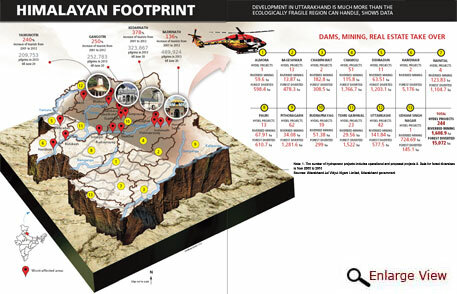 Statistics of the forest department show that between 2000 and 2010, as many as 3,903.24 hectares (ha) forestland was diverted for mining projects (see infograph on p30, 31). To protest indiscriminate mining on the Ganga by a local quarrying and sand mining company, Swami Nigamanand fasted for 68 days and finally died on June 13, 2011. The then environment minister Jairam Ramesh wrote to the then chief minister Ramesh Pokhriyal demanding an end to illegal mining. No action was taken. What the state government did was form a new mining policy which facilitates auctioning of sites identified by the department of mining and geology. Forest officials favoured passage of the policy and stated that it would help the state government realise a profit of Rs300-Rs350 crore. When Vijay Bahug una became the chief minister in 2012, tenders were floated for mining, diverting additional 1,608 ha for mining. Unscientific mining helped rivers increase their width and change course this time. As per mining guidelines, not more than 0.9 metre should be dug, but private mining companies go as far down as 9 metres. Y P Sundriyal, professor of geology at Hemwati Nandan Bahuguna Garhwal University in Srinagar, Uttarakhand, explains the aftermath. During monsoon, when the river swells, it tilts towards the dug up area, not only changing its course but also putting roads and houses along the riverbank at a high risk, he says. In the last decade, the state government has diverted 15,072 ha forestland for roads, irrigation, power transmission and hydel projects. 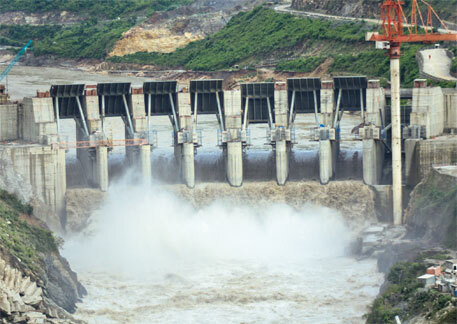 The website of Uttarakhand Jal Vidyut Nigam Limited (UJVNL) shows that 45 hydropower projects with a total capacity of 3,164 MW are operational in Uttarakhand. The state plans to build 199 big and small projects. In the Alaknanda-Bhagirathi basin alone, 69 hydropower projects are built or proposed, states a report prepared in April 2013 by the environment ministry’s Inter-Ministerial Group (IMG) formed to consider environmental flows and hydropower projects on the Ganga and its tributaries. Dams, no doubt, are essential for meeting energy requirements. But it is equally essential that the state government assesses how much hydropower it actually needs. Dam construction involves blasting, excavation, debris dumping, movement of heavy machinery, diversion of forests and rivers. This has a huge cumulative impact on Himalayan ecology. The need is to make sustainable use of resources with minimal disturbance to ecology. “The way projects are being executed is disastrous,” says Vimal Bhai of Haridwar-based non-profit Matu Jan Sangathan. The 69 projects, when implemented, would affect 81 per cent of the Bhagirathi and 65 per cent of the Alaknanda. Most of these are small projects which would reroute rivers’ water through tunnels cut through the mountain, leaving long stretches of the rivers dry. Worse, the project proponents do not leave enough space between two projects for the river to regenerate. Two projects should be at least 3-5 km from each other, Delhi non-profit Centre for Science and Environment (CSE) has submitted in the IMG report. The problem aggravates because small projects do not require environment impact assessment (EIA). The cumulative impact of so many dams on a river can be horrendous. But there is no legal requirement to cumulatively assess the impact of a series of dams on a river during the EIA process. In view of a Central Water Commission report that reservoirs on some rivers like the Ramganga are overflowing with water 440 per cent above the normal mark, scientists say there is a need to review dam building concepts such as Design Flood. This ensures that the dam can hold enough water to avert even a disastrous flood that may occur once in a hundred years. But the Indian standard for fixing criteria for design flood for safety of dams does not directly incorporate the concept of hazard, states a study by N K Mathur and Bhopal Singh of Central Water Commission in 2012. G P Patel, managing director of UJVNL, believes there is no link between dams and the recent floods. “Had dams like Tehri not been there, devastation would have been manifold. The entire western Uttar Pradesh would have been washed out,” he says. On June 16, when the Bha girathi was swelling, the water level in the Tehri reservoir reached 775 metres from 750 metres. The reservoir can accommodate water up to 830 metres from the mean sea level. An engineer at Tehri Hydropower Developme nt Corpor ation, who did not wish to be named, says the dam was able to avert the disaster because rains came in June, when the water level was low. Had a similar situation occurred in Oct ober, devastation would have been greater, he says. Officials fear if there is more rainfall in the coming days, Tehri’s floodgates may have to be opened. The situation aggravated this time because of indiscriminate dumping of debris and muck along the riverbanks. “This increases the erosive capacity of the river, which increases the river’s water level,” says Sundriyal. “This causes extensive destruction in the downstream,” he adds. Environment ministry’s guidelines say sites to dispose of debris should be identified in advance. Unplanned construction of hydropower projects also affects river’s ecological flow, or the minimum water a river requires for its ecosystem and human needs. IMG recommended that between November and April, at least 30 per cent water of the river’s flow should be maintained. Between May and October, the monsoon season, the ecological flow should be 20 per cent. As many environmentalists submitted a dissent note to this, CSE gave an alternative after studying hydrological data of 24 hydropower projects. It found that in winters, river’s flow was less than 10 per cent of the high monsoon flow in almost all 24 projects. If less than 50 per cent water is left in the river, it will be reduced to a trickle in these months. CSE suggested 50 per cent flow for six months during winters and 30 per cent flow in the remaining six months. Based on this analysis, it stated that it is possible to build hydropower projects on a river and still allow ecological flow. Thanks, this is very good article, a detailed analysis. Not scratching the surface like other media does, but in-depth. I have been following downtoearth for uttarakhand floods, your articles and updates are very meaningful. Thanks to all. This calamity is man-made, but where there is money and power, there is greed. I am sure, nothing will change after this and no lessons will be learned. Nature will keep teaching us like this, hard to harder. Uttarakhand is most beautiful state of India, it must be prevented, but I guess there is nothing that people can do about it, whichever govt comes to US, it will continue to allow projects in this area. I am much pained and anguished to watch and read about what happened particularly at Kedarnath and Uttarkashi. The way the construction activity was allowed by local bodies/government shows the apathy of those who matter, plus apathy/greed of all those who constructed the innumerable hotels/lodges etc in these fragile areas. Varunavrat Parvat is well known for its massive landslides. In 2003 a warning issued by the geologists of Geological Survey Of India working at the top of Parvat, was heeded by the District Magistrate and the inhabitants of several houses at the toe of the hill were moved to safer places. The slide that took place thereafter razed most of the buildings-no loss of life was there. In 2010 the slide came with a vengeance because many more structures had come up at the place where it had struck earlier-but our greed/need is perhaps much more! Still more houses were allowed in this region-bringing devastation this year with several lives too lost. Lesser said the better about Kedarnath-GSI had identified 28 Avalanche prone zones in the valley. Such zones are pathways for landslide too during rains. But when you have a golden egg laying hen, you forget the advice, not to slaughter it-and the result is in front of everyone. It is better to spare Kedarnath, reconstruct the damaged temple, do not permit a night's stay there-pilgrims should return the same day. Naturally this would entail only fit and able people to visit the place. Am sorry to sound harsh-but it is better to be harsh than allow so many lives to perish for no fault of theirs. Very well written and precise article. I was shocked to read such massive destruction of life and property and still, some people took this advantage to earn money from these people who are suffering the pain of loosing everything. Such terrifying tales woven so beautifully into one whole. ItÃ”Ã‡Ã–s crisp, to the point and yet the disaster has been sketched on a wide canvas that makes it an engrossing read. The article is truly down to earth, concentrating on the simplicity of reporting from the spot. Thanks because of this article i came to know about the real cause of the devastation. Actually it is not natural it is infact manmade disaster. So development must go on but keeping pace with environment. Not able to understand how the governments could be so careless in training it's people in disaster management. Why did they not prepare well for such casualties especially when a few smaller ones have happened in last two years? Is NDMA's duty only issuing guidelines? Has NDMA escalated the matter anytime to PM when it found states have been careless on this? And wasn't much more that meteorological department would have done (though it seems its the only organisation that doe done job well, before the disaster)? The whole episode seems to reflect the recklessness of the people and systems. It's time we all take our job seriously, pretty damn seriously. Outstanding article by the team. Thought provoking.